Our health clinic offers birth control pills, DepoProvera, intrauterine devices (IUD), and Nexplanon. For those who cannot use these methods, we give counseling and referrals. For those receiving DepoProvera we require two negative pregnancy tests (separated by 10 days) before initiation of contraception. Our nurse practitioner provides a breast exam as part of the well woman exam or if you are experiencing other breast symptoms (such as self-detected breast lump). Referrals for mammography are available and self-breast exam education is provided to patients. When possible, mammogram funding is made available to qualifying patients. This program is supported by the Mother’s Day 5K “Run 4 Her Life”. Urine pregnancy tests are available at our health clinic. We request that you wait 10 days after a missed period before visiting with us for a pregnancy test. This can help prevent a false negative result. The visit includes pregnancy counseling and proof of pregnancy (required for prenatal Medicaid coverage) for the Family Services Department (FSD). We test for gonorrhea, chlamydia, trichomonas, HIV and syphilis. We can also diagnose herpes or warts by clinical appearance of lesions. Positive STD counseling and treatment are provided free of charge. Although we are primarily a women’s health clinic we can do HIV and syphilis testing for males. Referrals for other male STD testing are available upon request. A well woman exam consists of an overall physical exam (e.g. listening to heart and lungs), a pelvic exam, breast exam, STD testing, Pap smear (starting at age 21) and birth control counseling. Well woman services funding is available to qualifying patients. This program is supported by the Chris Burger Cancer Foundation. Do my parents have to know about my visit? No. All information is kept confidential and no parental consent is required to have an exam or to begin a birth control method. No. We are able to see some patients without an appointment at our walk-in clinic, but we see patients scheduled for an appointment first. You are guaranteed to be seen only if you have an appointment. 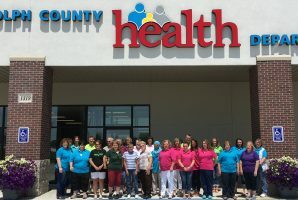 Is the Randolph County Rural Health Clinic a free clinic? No. Our prices are lower than most private doctor offices and we offer discounts based on your household income. Some patients may qualify for free pricing. Do I have to pay before I am seen? No. We never withhold medical care or birth control based on inability to pay. Can I be tested for all STDs at your health clinic? There is not one test for all STDs. We draw blood for HIV and syphilis testing, take a cervical culture for gonorrhea and chlamydia testing, and look at a sample under the microscope for trichomonas diagnosis. Herpes and warts (HPV) are diagnosed by clinical appearance at our health clinic. Screenings are an important part of health promotion efforts. Many preventive screenings have been recognized as a cost-effective way to identify and treat potential health problems before they develop or worsen. Age- and gender-specific preventive screening recommendations exist for dozens of health concerns. Contact your health care provider to see what screenings are available. Blood tests, urine tests, and other types of lab work help diagnose illnesses and monitor the effects of medications and other treatments. They are valuable tools that can identify the cause of your symptoms or make sure the medication you are taking is working as it should. At the Randolph County Rural Health Clinic, we perform several laboratory tests to help you manage your health. Bring in an order from your current primary care provider or make an appointment with one of our nurse practitioners to get your lab testing started. Genetic testing and counseling services are also available. We can test 27 genes associated with 8 types of cancer. Most insurances pay up to 100% of the cost. Lead is a toxic substance that may be present in dust, paint, soil, and drinking water. When ingested or inhaled as dust, lead poses a serious health risk to young children. Low levels of lead exposure can cause nervous system and kidney damage, learning disabilities, poor muscle coordination, slower growth, hearing losses, and also speech, language, and behavior problems. While low level exposure is most common, exposure to high levels can have devastating effects including seizures, consciousness, and even death. Any child may be at risk for lead poisoning; however, children under the age of six are at greatest risk for lead poisoning due to their frequent hand-to-mouth behavior and rapid development. Lead poisoning can occur regardless of financial, social-economical or cultural status. This testing does not require an appointment at the Randolph County Rural Health Clinic, walk-ins are welcome. If your child needs a physical exam before being admitted to their daycare or preschool, please contact our health clinic to schedule an appointment. We offer an age appropriate head to toe examination. Sports physicals are a common requirement for anybody participating in an organized sport. Sport physicals look at a number of issues to help determine whether it’s safe for you or your child to participate in the sport of your choice. That’s because high-intensity workouts can cause injury or worsen a pre-existing condition. Plus, if you’re not in good physical shape to begin with, your coach might need to make changes to the program to give your body time to adjust. More and more companies are now requiring pre-employment exams from potential employees. Some of these exams have to do with the nature of the job. For example, workers might be examined to confirm they are in good form and can perform jobs that are physically demanding. These exams not only protect the employee from work injuries, but also protect the company against work-related lawsuits for injuries that could have been prevented had the employee been in good physical condition in the first place. Primary care providers (or PCPs) are those physicians and nurse practitioners who deliver comprehensive health care in the clinic setting. This means they take care of a wide variety of problems –acute medical illnesses such as common colds, sinus infections, stomach problems, and skin rashes, for example, but also more chronic health problems like acne, depression, asthma, high blood pressure, and allergies. Primary care providers also do physicals and annual women’s health care examinations, counsel their patients on healthy lifestyle choices, and recommend and prescribe birth control pills and other medicines. In sum, they provide total health care and work closely with specialists in other fields of health and medicine to keep their patients (you!) healthy. Tuberculosis (or TB) is spread by tiny germs that can float in the air. The TB germs may spray into the air if a person with TB disease of the lungs or through coughs, shouts, or sneezes. Anyone nearby can breathe TB germs into their lungs. These germs can live in your body without making you sick. This is called TB infection. Your immune system traps TB germs with special germ fighters. Your germ fighters keep TB germs from making you sick. But sometimes, the TB germs can break away and spread. Then they cause TB disease. The germs can attack the lungs or other parts of the body. They can go to the kidneys, the brain, or the spine. If people have TB disease, they need medical help. If they don’t get help, they can die. How do I know if I have a TB infection? A skin test is the only way to tell if you have a TB infection. The test is “positive” if a bump about the size of a pencil eraser or bigger appears on your arm. This bump means you probably have a TB infection. The TB test can be provided on a walk-in basis, but requires two separate visits within 48-72 hours of each other. For more information on the TB test or tuberculosis click here. To identify school-age students with potential visual/hearing impairment/problems and to make appropriate referrals to eye/ear care professionals as necessary for further evaluation and possible treatment to help promote the student’s health, learning and school performance. Snellen Eye chart for near-sightedness (tests far vision). Pure Tone AudiometryFrequencies of 1000 Hz, 2000Hz, and 4000Hz are screened in both ears. Children must hear two out of three tones at 20 dB at 1000Hz and 2000Hz and 25dB at 4000Hz. ERO-SCAN ClassicEtymotic Research introduced the ERO•SCAN® OAE Test System, the first truly handheld otoacoustic emissions measurement system in 1998. The system featured an intuitive and easy-to-use interface that made the product a worldwide success in newborn, early childhood and school screening, where testing is often conducted by technicians, assistants and volunteers. Another feature contributing to the ERO-SCAN’s ease of use was a novel, patented noise rejection algorithm that permits accurate OAE measurements in background noise levels as high as 70 dB SPL. The effectiveness of this algorithm allows for successful testing of infants and children in less than ideal settings where high ambient noise makes testing with other equipment impossible. Ideally, you shouldn’t wait until your child is sick to take him to a doctor. Regular pediatric exams are a great way to make sure your child is in good health and developing properly. A proper pediatric exam is about more than just a physical exam. It should also include a pediatric history, so your medical provider can keep track of everything that’s changing in your child’s life.